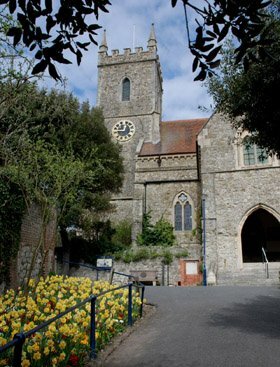 Welcome to the parish of Hythe, in Kent, with its parish church of St Leonard, the church of Holy Cross, and St Michael's Methodist-Anglican Church Centre. St Leonard's church is open to visitors every day from 8 in the morning until at least 5:15 in the afternoon, and often later (for choir rehearsals or other events). It is known as the church with the bones, and is famous for its ossuary (or "crypt"), which is open at Easter and then from May to September every year. Visitors please note the ossuary and crypt are now closed for the winter until Easter 2019. Click here for more information, and for special access arrangements. Please use the menu links on the left to find out more about our churches, our services, and our programme of music and events, promoted by the Friends of St Leonard's Church. If you're coming to visit us for the first time, please use the "Latest news and what's on" page to check for any special events or alterations to our usual service times.